Phalanx is a Boss in Demon Souls. The Phalanx itself is a blob of viscous purple slime engulfing a gnarled, tree-like core which in turn contains a glowing white aura. However, the Phalanx starts the battle completely covered with and surrounded by Hoplites. The Hoplites will re-spawn, after a period of around 2 minutes or so per small group of Hoplite, until the last one is slain.They will also regenerate their health, if they re-attach themselves to the Phalanx, after being hurt. The Phalanx will also regenerate its health, if not attacked for a period of time, until the last Hoplite is slain. Phalanx is particularily weak to fire based attacks. Phalanx can be easily toppled by a class that primarily uses melee. Simply two-hand your chosen weapon, coat it with Turpentine, and attack Phalanx directly. Do not use lock on. If you lock on your mobility will be slightly limited when you need to heal or recover Stamina. Don't hesitate either. The worst thing you can possibly do is stand around hesitating while Phalanx pummels you with its projectile attacks. Retreat back a few steps when your Stamina gets low, then rinse and repeat. Hide behind a pillar and heal when necessary. Using this tactic you can often take out 4 or 5 of the Hoplites at one time as they all group extremely close together on Phalanx's body. This works best for the Knight, Priest, Soldier, Temple Knight, and Hunter classes. It also works with the Royal, Barbarian, and Wanderer classes although players using these classes will find themselves healing more often. The Wanderer class in particular has a very fast attack animation, but a half second wind-up between each hit that can cause trouble. This approach does not work well for Thief or Magician classes. Use Firebombs to kill as many Hoplites as you can (you can find a total of 11 in 1-1 or purchase more from the Dregling Merchant for 500 Souls each). Run behind a pillar and apply Turpentine to your weapon. Sprint around to the back of the Phalanx and look for a side that's not covered with Hoplites. Burn the Demon until it's dead. Using weapons with both hands will decrease the chance of being stunned should you hit one of the Hoplites shields. You can pick off Phalanx's little buddies without using Firebombs or Turpentine. Just run around the perimeter of the room and dodge the spears. Some of them will break away and you can get behind them and kill them off pretty fast since their backs are vulnerable. Just keep doing that until you've killed enough of them. As above, when a hole is formed hack away at phalanx. He isn't very hard. For the Magician and Royalty class, the Hoplites can be easily taken out with Flame Toss or Soul Arrow. Keep moving sideways and kill them one by one, or run across the room to scatter the Hoplites, pick off stragglers on the way. Hide behind pillars to heal or replenish mana. Since the Magician class does not have a mana regeneration ring, buying a couple of Fresh Spice from Blacksmith Boldwin before entering the boss area is advised. Phalanx in itself is a harmless blob of darkness, having no real form of attack. It relies on its coating of Hoplites to attack you with spear throws and stabs (at close range). However, it can move, albeit slowly, to back the player into a corner, and release its Hoplites voluntarily in an attempted flanking maneuver. Phalanx has exactly 35 Hoplites upon spawning, but can regenerate them when they die, as well as create more to exceed the original count. As more Hoplites are slain, the remaining creatures will slowly move to cover the side of the Phalanx that faces the player, leaving the other side exposed. The Phalanx is named after a defensive tactic used by the ancient Greeks, most notably the soldiers of Sparta, the Spartans. 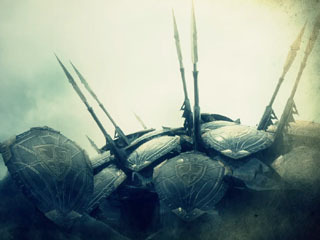 It entails forming a sort of wall using a group of soldiers' shields and thrusting at opponents with spears from behind the wall. The wall could also be tilted upward to deflect incoming arrows. After all the hoplites on the Phalanx are killed, it will slide towards you when you're far away from it, but slide away from you if you're close to it.